I had an absolute blast at Four State Comic Con this past weekend! Since I’m a planner, I had done a test set-up for my table and packed everything way in advance. 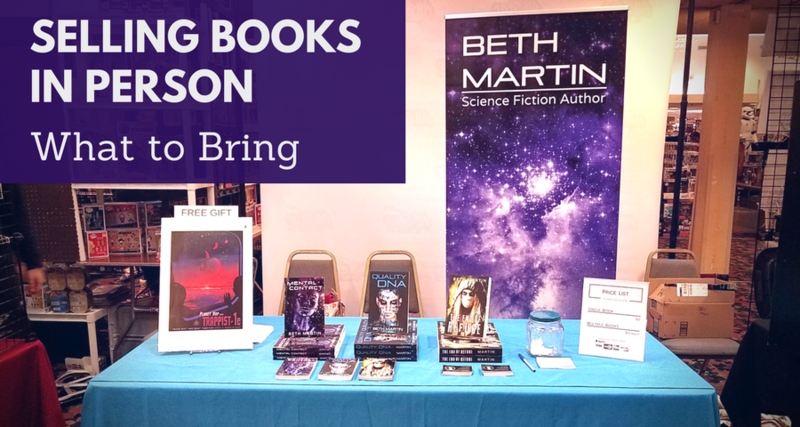 I thought I’d share all the items I brought to give you an idea of what’s involved in setting up a table to sell books at an event. Keep in mind that not all conventions and fairs provide vendors with the same setup. Some give you a measured space, and it’s up to you to bring furniture, flooring, or even a canopy. Others will provide tables, chairs, tablecloths, and signage. Access to electricity usually costs extra, if it’s even available. Since I’m still fairly new to the whole indie author scene, I try to keep costs down. Therefore, I would consider every item I’ve listed below as absolutely essential. I guess this is a no-brainer: books to sell. I’ve heard the estimate of bringing one of each book for every 100 people attending the event, but not all conventions can give an accurate number ahead of time. 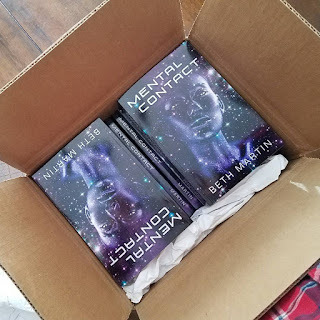 Since I went solo, I brought as many copies as would fit in my rolling suitcase. I recently invested in a retractable banner since they’re nice and big, but also easy to set up and break down. Previously, I’ve used a smaller banner attached to a foam board. If I had a larger table, I could have brought both. A tablecloth is a small and cheap item to bring which has a HUGE visual impact. Although it seems like an insignificant detail, bringing one separates the pros from the amateurs. Even though they were provided at this particular event, I like to have my own in an eye-catching color. Also, it helps hide the bottom of the table, giving me plenty of space to stow my stuff. Not only are events great for selling books, but they’re also excellent opportunities to network. Of course I offered a card to everyone who stopped by my table, but I also gave them to all the other artists and creators. Everyone meets lots of people at a big convention, so I included my picture on my cards since it’s hard to recall each individual’s name. There are countless articles dedicated solely to the topic of swag. I understand it’s easy to blow tons of money on all kinds of cool items to hand out, and I was definitely tempted to do so myself when I went to my first convention. 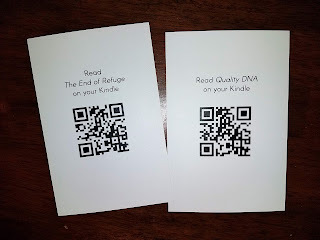 In the end, I stuck with something that would remind people to purchase my books if they didn’t buy a copy in person. I settled on postcards since they nicely fit a bookcover, were somehow more affordable than bookmarks, are small and easy to pack, and are fun to collect. 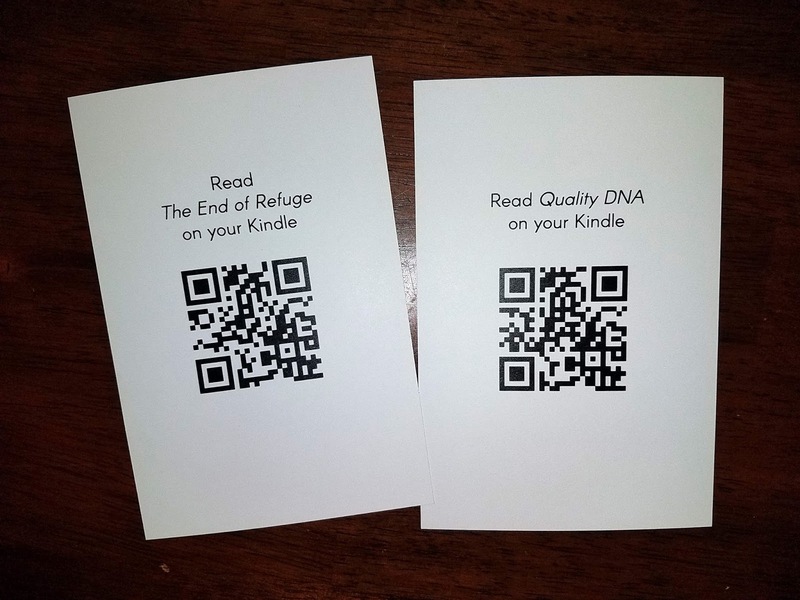 On the back, they have a QR code linking to the book’s Amazon page. I purchased my banner, business cards, and postcards all through Vistaprint, and when they emailed me a sweet coupon, I used it to get some small posters. They're the cool travel posters with an Art Deco style made by NASA. Since I only paid shipping for them, I gave them out as freebies to fans who purchased a copy of Mental Contact. I looked everywhere for those acrylic sign holders that fit a letter-sized piece of paper, but they’re expensive at office supply stores. I eventually found some at Walmart for $1.88 apiece. They’re technically 8 x 10 photo frames, but serve their purpose perfectly. I like to have a sign with prices and one asking people to sign up for my newsletter. It’s hard to make out a book’s cover when it’s laid flat on a table, so some sort of display stand to get them upright is essential. I use wire ones that are supposed to hold decorative plates since they were the most affordable option. Customers need something to carry all the books they purchased. I originally had teal bags, which matched my tablecloth, but I saw artists using clear bags and gave them a go. It’s fun to see what all the attendees are purchasing, and it’s basically free advertising. There’s a variety of ways to ask for people’s emails. Some artists have a tablet dedicated to collecting information, and lots of vendors stick to the trusty clipboard. As someone who’s paranoid about information privacy, I asked people to write down their email on a slip of paper, then throw it in a jar. This also works for hosting a giveaway, but I decided not to do one this time around. I sell books for a nice round number amount (when sales tax is included) so I don’t have to deal with coins. A handful of ones and fives was plenty. I use PayPal Here, which I love. The transaction fees are reasonable, and I already use PayPal for a lot of business expenses. The app also allowed me to email receipts and track cash transactions. Instead of keeping notes on the number of sales and copies sold, I just put everything in the PayPal app, and it keeps track of everything for me. No one has asked me for a paper receipt, but I brought a few just in case. People unintentionally swipe pens all the time, so I always bring a bunch. I keep a couple on hand. I like using colored sharpies for signing books since they stand out better than black or pen. This is important and not commonly mentioned. It basically says I’m registered to pay sales tax in Maryland—I know, real fun. But I have had event organizers ask to see it in the past, so I always bring it along. I mentioned this in my post after Galactic Con, but it’s worth pointing out again. Wear comfortable clothing. Everyone was dressed pretty casually, including artists and vendors. Most important was wearing comfortable shoes since I was on my feet 8+ hours each day. Sometimes it’s awkward to drum up a conversation with random people, especially when trying to sell something. I’ve heard the tip to wear a unique piece of clothing or accessory to catch people’s attention, and I’ve found blue hair to be the best ice-breaker. Everyone stops to say something about it: men, woman, the elderly, children. While wearing something that’s naturally attention getting, people will actually approach me to start a conversation. And once the ice is broken, I start talking about my books. I packed a few snacks and a water bottle. I’m one of those people who always gets cold, so I brought a sweater. Also, as a lady, I made sure to have plenty of feminine products on hand just in case. Well, that’s my complete list. Even though it sounds like a lot, I was able to get everything into my big suitcase. Except for the banner, which already has a convenient carrying case.